I thought it might be fun to write a page around different pictures of kilts, as many of you seem to enjoy looking at them. So since this is my web site and I can therefor do what I want with it, here's the page (no seriously there is a big demand for pictures of kilts, and I trust this page helps satisfy that demand). But rather than just upload a collection of pictures and call it a gallery, as so many sites tend to do, I thought I would do something a little different and feature kilts being worn in different settings, and some of the varieties of kilt outfits seen across the world. 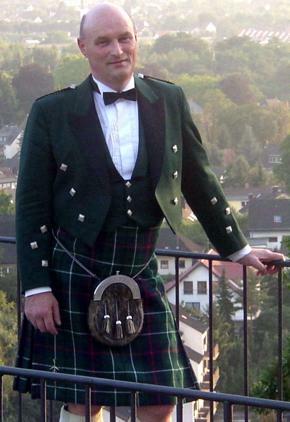 One of the most popular kilt outfits, is the kilt being worn to formal occasions, as you can see in the following photo of me, in my Prince Charlie jacket and kilt, this outfit is considered Full Highland Dress. Now this kilt outfit can be worn to any formal occasion you can think of, such as weddings, Gala Dinners, Hogmanay parties, the list is endless. It all depends on which accessories you choose to wear with your kilt, but one thing is almost certain, when you are out and about wearing your kilt you will be asked to have your picture taken. 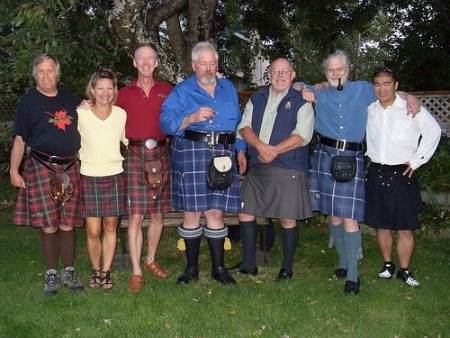 The next photo shows a group of friends, all wearing their kilts in a much more casual way, having a good time together. 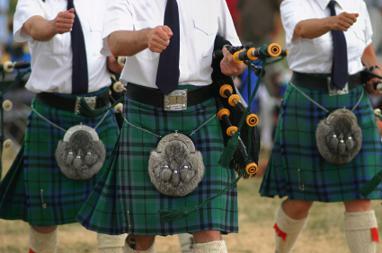 The Scottish kilt is also worn by Scottish pipers, and of course pipe bands which are a common sight around the world. But lets not forget that Irish pipers and pipe bands also wear kilts, and that the Irish military kilt is very distinctive. 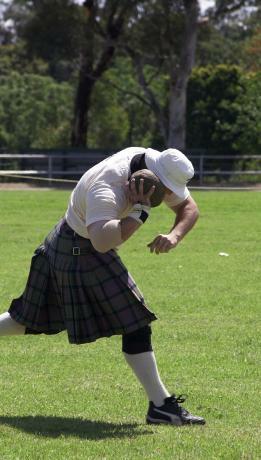 You will also see the kilt being worn at Highland Games, in many different countries around the world, here it is seen in a much more casual manner when being worn by the athletes. This setting is also a chance to see the kilt being worn by Highland dancers, as they compete in competition at various Highland games during the summer months. Other areas of the United Kingdom also wear the kilt, The Isle of Man is a good example, below you can see one of their tartan kilts being worn with a Jacobite shirt, which also gives the kilt a casual look. 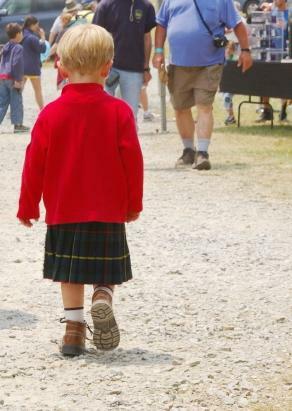 No pictures of kilts page would be complete without a photo of a small boy wearing his kilt, and I like this particular picture as it shows that kilts for children are both practical and comfortable. So there you have my pictures of kilts page, and I hope you have enjoyed looking at kilts being worn in a few different settings. If there is a particular kilt you would like to see, and you can't find it on the site, then please drop me a line using the "Contact Us" page and I will do my very best to find a picture of it for you.